Some welcome rain and embedded storms are anticipated for eastern NSW and eastern Victoria today. Storms may also develop beyond the cloud mass. 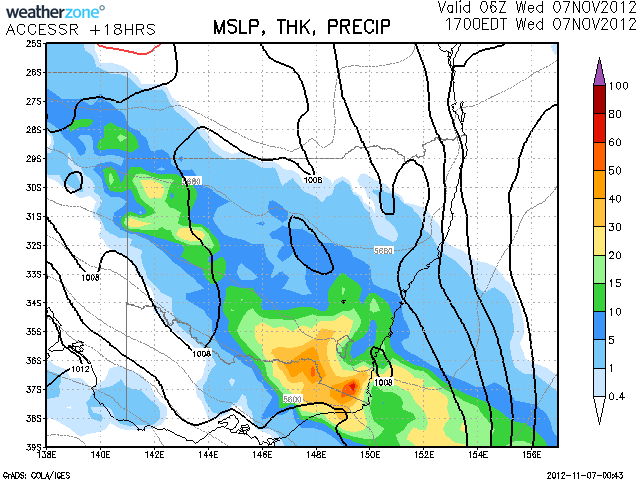 It should be widespread and gradually contract to Queensland by Saturday. Storms may occur even in Sydney and Hunter region and surrounds. Canberra and Bairnsdale radar showing substantial widespread rain late this morning. Warning for heavy rain in eastern Victoria for today. Harley, are you chasing again today? Severe thunderstorm warnings out for the central west slopes and south west slopes specifically for heavy rainfall. I am looking for a reason to chase but nothing substantial or worthwhile. Thunderstorms have drenched a region around Broken Hill to isolated areas north of Hay and west of Ivanhoe including Menindee. The GPATS lightning tracker shows 24,956 ligtning flashes during the period 10 am to 10 am 6/11/12 to 7/11/12. The storm cells are in very isolated remote areas of NSW and in areas outside radar coverage. Menindee has collected 45 mm of rain. Griffith has collected 57 mm of rain. I am watching to see if any storm comes further east but they seem to remain in far west and NW NSW. Rain has contracted to the SW slopes and SW NSW with the very ocassional lightning flash. Any storm is embedded within the cloud mass and the rain cells. Hi Harley, this seems to have been the way I was looking for today as seen in the post above. I was talking to Nick Moir yesterday in response to chasing storms it would have to be behind the rain band in southern NSW near Hay. This is all ahead of the wind change. Harley, can you please plot that lightning tracker map – thanks. Jimmy, here is the GPATS lightning plot for NSW. Between 3 pm yesterday and 3 pm today 6 to 7 November there have been 37,043 lightning strikes. Majority of that is within that north west quadrant of New South Wales beyond radar range and where few live. The cells can only be made out on a satellite photo. As I write this they have moved slightly east but they are still west of Cobar, Bourke and Ivanhoe. I have noted looking at the plot, the cell I saw near Mittagong yesterday appears to have produced a small number of lightning strikes. The small number of flashes across southern NSW has been within that rain band. Generally that rain band is not active with storm cells. Very impressive once again – quite a few strikes in that area. Decent cells tracking north of Windsor through to Hornsby and the Central Coast at the moment 5:14pm. 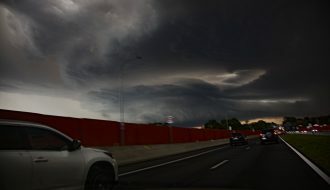 Storm split near St Albans – detailed warning on it – large hailstones and damaging winds. I hope the guys from the Northern Suburbs are onto this. Issued at 5:16 pm Wednesday, 7 November 2012. 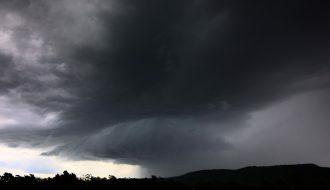 The Bureau of Meteorology warns that, at 5:15 pm, severe thunderstorms were detected on weather radar near the Yengo National Park northwest of St Albans and Cattai. These thunderstorms are moving towards the southeast. They are forecast to affect Glenorie, Maroota and Wisemans Ferry by 5:45 pm and Brooklyn, Mona Vale and Terrey Hills by 6:15 pm. Large hailstones and damaging winds are likely. The next warning is due to be issued by 6:20 pm. There's 1 severe looking cell just to the NE of Glenorie heading towards Avalon worth keepin n eye on now. Harley Pearman got onto the cell near Maroota but being in the core, I assume he would have had to be on the northern side to get to any possible hail. He got very heavy rainfall. I could hear thunder from strong lightning strikes even from here at Schofields. We only had a passing shower here. Shane did you get onto the cell? Post any pics if you have a chance. Storms seem to have weakened. 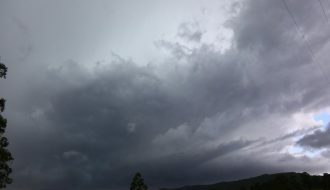 I did get onto the storm cell at Glenorie / Cattai and towards the Wisemans Ferry area. I do not have any decent photos as I was driving and found myself underneath a rain free base with no opportunities for short stops. Driving along Pitt Town Road up towards Wisemans Ferry, I made a serious attempt at keeping ahead of the rain shaft but beyond Cattai and just before South Maroota, the precipitation core overtook me. I found myself within very heavy rainfall and some high winds but no hail. Some cloud to ground lightning was observed. I pulled off the road some 15 km from Wisemans Ferry and by that stage, the storm had completely overtaken me. It went into decline shortly after. There was a second storm cell to the north of that one but by the time I had a good view of it without rain, that too was going into decline. Upon my return, I noticed some small branches from trees along the side of the road brought down by the storm.